In late June-early July 2009 it was the expedition with aim to reveal breeding places of Spotted Eagle in the north of Chernihiv region. The expedition was taken under the project competition announced by Ukrainian Birds of Prey Research Centre. A question of accurate definition of distribution and numbers of the Spotted Eagle in Ukraine is still open. Till mid-1990s this Eagle has bred in most regions of Ukraine (Zubarovsky 1977). Researches of last decades proved existence of the Spotted Eagle only in the north-west of Ukraine, namely in Rivne and Volyn region (Dombrovsky 2007). Owing to our colleagues from Byelorus, after their special counts, it was found out that majority of Belorussian Spotted Eagles inhabits Prypyatskoye Polissia in the areas neighboring to Ukraine. A part of this breeding group also inhabits the area of Ukraine. At present there are no reliable data proving breeding of this species in other regions. The Spotted Eagle looks much alike a related and more numerous species of the Lesser Spotted Eagle which often causes misidentification by ornithologists. In Ukraine the Spotted Eagle is sometimes observed on migration. Rough estimation of the bird numbers within Ukraine shows only 10 to 20 pairs. Surely, comprehensive investigation of its prospective breeding places in the near future can give a more precise picture of the Spotted Eagle population. This is the aim why we undertook expedition to the north of Chernihiv region. This species of Eagle prefers breeding and hunting on wet areas without or with minimum of human activity. Also it avoids the areas with settlements located nearby. When defining the expedition route we gave preference to big melioration systems situated within vast woodlands. That is why we investigated two areas of such a type in Ripky district, also in this district we searched two old, abandoned and large peateries on Zamglay Bog. Also we preferred to investigate the floodplain in the middle course of the Snov River. They were the parts of the floodplain situated along the border with Russia which we consider to be the most promising to meet the Spotted Eagle. 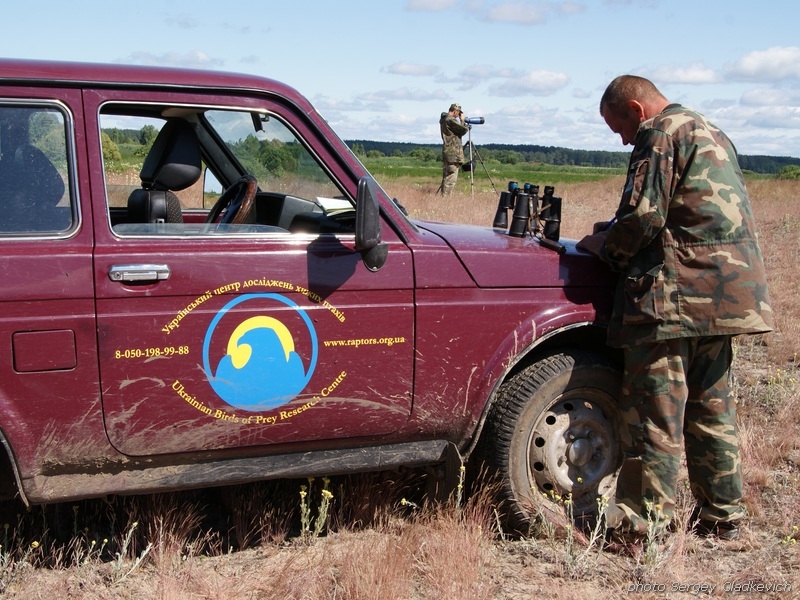 The expedition took place from 25.06 to 8.07.2009 in districts of Ripky, Gorodnyay, Shchors, Semenivka, Korop, Novgorod-Siversky and Koryukivka district by a car ‘Niva’. The counts of birds of prey were taken according to the method of Dombrovsky and co-authors (2000, 2001) taking into account our own experience (Domashevsky 2004). In our case census points were 2 to 5 km apart depending both on landscape and surrounding vegetation, and also on possibility to reach a convenient position with good viewing. Duration of stay at census points was from 1.5 to 3 hours. 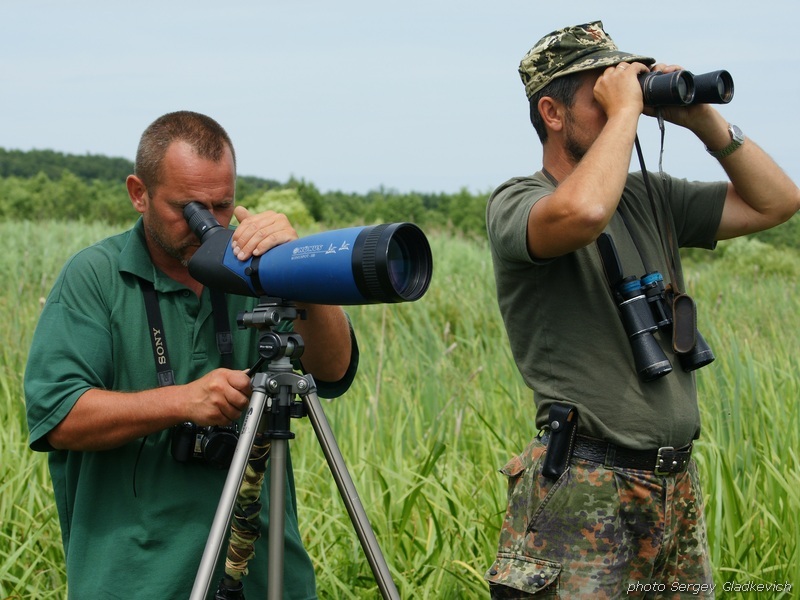 For observations we use binoculars with 10-15×50 magnification and a telescope with a changeable magnification 20-60×100. Points and places of bird registrations were mapped. In case if viewing was not enough for a qualitative observation we climbed on a solitary tree in the floodplain and took counts from there. In the floodplain of the Snov River Counts we began counting birds of prey downstream from the city of Shchors (Smyach Village). Then our route went upstream to the place of inflow of the Revna River. A total of 44 km of the floodplain was investigated with 13 census points fixed. After that it was investigated the floodplain of the Revna River from its mouth to the place of inflow of the Rvanets River. A total of the investigated floodplain was 20 km with five census points. As for the Rvanets River it was investigated 8 km of its floodplain with 2 census points. In all, we set up a total of 28 census points where we spent many hours of observations. Also birds of prey were counted when riding by car. The total length of the automobile route was about 2,000 km. It should be mentioned that in some areas a picture shown on a topographic map was not equally corresponded to real. Most areas of the floodplain of Revna and Rvanets rivers were rather dry. Main part of the floodplain and near-floodplain forests of the Snov River turned out to be young and not quite suitable for inhabitance of the Spotted Eagle. Old areas of woodland occurred only as small inclusions because of mass and uncontrolled cutting of mature forest. In some places forest roads got ruined, so participants of the expedition reached to open spaces across barely passable boggy forests. Such heavy-going areas were located in rarely visitable regions bordering Russia. “Pleasure” of the expedition participants was added by extremely hot weather and abundance of blood-sucking insects. During hot daylight hours they were botflies attacked the car and its passengers and hampered to work with optics at census points, in the evening it was turn of blackflies and mosquitoes. Unfortunately, during the expedition we did not record the Spotted Eagle anywhere. We thoroughly investigated the remotest depths of the Snov floodplain, were sitting on tree-tops for hours suffering from heat and botflies. But we have to state the fact that this Eagle is absent in areas of our investigation. Having chosen the most interesting and promising areas for its inhabitance we got a negative result. More likely this species did not breed there anymore or its occurrence in the region is only supposed. Also V.N.Grishchenko had not seen this bird in the floodplain though went by rafting a part of areas where we took our investigations (Grishchenko et al., 2000). Maybe we were not lucky this time. The last time we recorded this species in abreeding period in Chernigiv region was on Bondarevskoye Bog in 2007, when we saw a hybrid pair of Spotted Eagle and a Lesser Spotted Eagle (Domashevsky 2008). However we’ve got a pleasant surprise in the course of expedition. At last we solved a question of a type of stay for such a rare breeding species as the Hen Harrier in several districts of North Ukraine. In Ripky district on a partly overgrown meadows we observed 2 males of this species. One of birds carried a prey to boggy meadow areas. Also a female carried her prey to the same direction. We didn’t manage to find the nest because of shortage of time. Other two territorial birds were recorded in Shchors district in the floodplain of the Snov River at the border with Russia. So, this is the first registration of the Hen Harrier with evidence of breeding in Ukraine for the last several decades. In spite of fault with the Spotted Eagle we have collected an extensive material on distribution and numbers of other species including rare ones. We recorded a total of 12 species of raptors during the expedition. On 44 km of the floodplain of the Snov River we have counted: Honey Buzzard – 11 territorial pairs; Black Kite – 3; Hen Harrier – 2; Montagu’s Harrier – 6 territorial males + 3-4 territorial pairs; Marsh Harrier – 30 pairs; Goshawk-3; Sparrowhawk-2; Common Buzzard – 38; Short-toed Eagle – 3; Lesser Spotted Eagle – 6 pairs (one of them evidently bred in Russia); Hobby Falcon – 2. On 20 km of the floodplain of the Revna River it was counted: Honey Buzzard – 1 pair; Montagu’s Harrier – 1; Marsh Harrier -1; Common Buzzard – 9; Lesser Spotted Eagle – 2; Hobby Falcon -1. On 8 km of the floodplain of the Rvanets River it was counted: Montagu’s Harrier – 1 pair; Marsh Harrier -2; Common Buzzard – 4; Short-toed Eagle -1. Total numbers of birds of prey for the expedition period were as follows (pairs): Honey Buzzard – 16; Black Kite – 8; Hen Harrier – 3-4; Montagu’s Harrier – 18-19; Marsh Harrier – 48; Goshawk – 5; Sparrowhawk – 2; Common Buzzard – 91; Short-toed Eagle – 8; Lesser Spotted Eagle – 12; Hobby falcon – 7-8 pairs; Kestrel -1. Dombrovsky, V.Ch. 2007. Toward breeding of Spotted Eagle in Western and South Ukraine. Berkut 16 (2): 205-212.